This book by Carlos Jose Errazuriz M. explains different juridical theories and the Church's response to each. The classical antijuridical theories--spiritualist and statist--are explained and scrutinized in light of Catholic tradition. New attitudes toward canon law since the reforms of Vatican II are presented and explained. 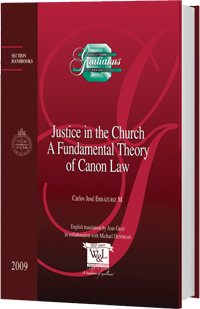 Finally, the author presents a fundamental theory of canon law based on justice. He offers both static and dynamic views of what is just in the Church and the role each plays in her life.